Pearse Doherty said that officials from the Troika told Sinn Féin that the chances of retrospective bank recapitalisation are “very slim”. SINN FÉIN HAS claimed that officials from the Troika told them today that the chances of Ireland being able to retroactively recapitalise its banks through the eurozone’s permanent bailout fund are “very slim”. 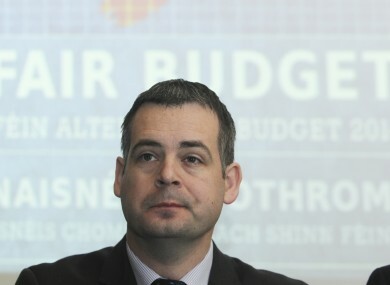 Speaking after the party’s final meeting with officials form the EU, IMF, and ECB in Dublin today, Sinn Féin finance spokesperson Pearse Doherty said that officials shook their heads as they informed him and other party representatives that the chances of retroactive recapitalisation are “very slim”. “The potential of recapitalisation – getting our money back which we put into the banks – they said, as they shook their heads, [that] it is very slim if no chance there because of political circumstances and the rest,” Doherty told the media. He added: “The Troika said to us, when we put the question to them, that there would be political circumstances that would have to be taken into account and the potential for this here would be low. He said that was the response from the European Commission, adding that the IMF said it was something the government should continue to pursue with officials in Europe. Of their meeting with the Troika today, Sinn Féin added that it was a very forthright engagement with the officials. Ireland is pushing for retrospective recapitalisation of its banking sector through the eurozone’s permanent bailout fund, the ESM. But progress on this has been slow since a historic decision was made in June 2012 to break the “vicious circle” between bank and sovereign debt. Prior to last week’s European Council summit in Brussels, Taoiseach Enda Kenny wrote to the 27 EU leaders and Council president Herman van Rompuy to underline the “imperative” of breaking the link between sovereign and bank debt, saying it is key to advancing Ireland’s post-bailout prospects. Email “Sinn Féin on Troika meeting: 'We gave it to them hard and heavy'”. Feedback on “Sinn Féin on Troika meeting: 'We gave it to them hard and heavy'”.